bruises, sunburn, 1st & 2nd degree burns, stings & insect bites, rashes, baby skin issues, chapped lips, blisters & cold sores, acne, aging & wrinkled skin, and much more! Seeing that Suuthe prodcuts are comprised of all natural ingredients really caught my attention, as the princess and myself have extremely sensitive skin. Our sensitive skin cautions me when it comes to skincare and the sometimes harsh ingredients that can lurk in moisturizers and other skincare products. We received the Suuthe's Skin Repair and Suuthe's Lip balm (pictured above), and after a week of use, I'm impressed with the results. My daughter has had problems with horrible dry skin this Winter. With the recent harsh Winter weather (coupled with months of having the house closed up and the heat on) it didn't matter how much cream or lotion we applied, nothing seemed to work. We have used the Suuthe Skin Damage repair on her daily (in the morning, and at night) and the results are visible; her skin is quenched and smooth, as it should be. 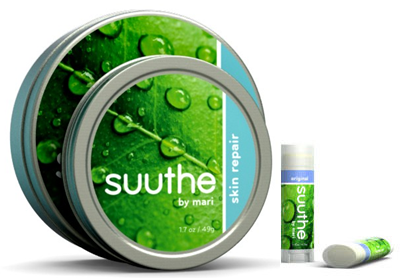 The lip balm by Suuthe is equally effective, my chapped lips are now smooth after month's of exposure to harsh winds and cold temperatures. 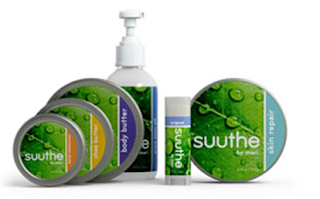 Suuthe products are the perfect remedy for sensitive skin!